Backed by results of a new air-quality study along with mounting pressure from local officials and the simmering discontent of local residents, Texas regulators have decided to install an air monitor in the heart of the Eagle Ford Shale. The Texas Commission on Environmental Quality (TCEQ) will install the monitor in Karnes County, the epicenter of one of the fastest-growing drilling regions in the nation. More than 10,000 oil and gas wells have been sunk since 2008, and residents have complained of breathing difficulties and other health problems. In February, an investigation by the Center for Public Integrity, InsideClimate News and The Weather Channel showed that the TCEQ knows almost nothing about air quality in the area. The series, “Big Oil, Bad Air,” found that from September 1, 2009, through August 31, 2013, there was a 100-percent increase statewide in unplanned, toxic air releases associated with oil and gas production and that companies were rarely fined, even when inspections revealed they were operating equipment improperly. Although the TCEQ conducts sporadic mobile monitoring and operates five permanent monitors at the edges of the 20,000-square mile Eagle Ford, little monitoring has been conducted in areas with the heaviest drilling activity. State Sen. Judith Zaffirini, a Democrat whose district includes Karnes County, said data from the new monitor will help the TCEQ “be better informed. We need to know what is happening before there are any problems. Zaffirini said TCEQ officials raised the issue of additional air monitoring in the county with her in February. She said the TCEQ then conducted mobile monitoring in Karnes County in April and May. The senator said TCEQ officials told her that the data didn’t show anything of concern. Because of all the production activity in the county, however, it was decided that installing a permanent monitor would be prudent. The device is expected in place by the end of October, Zaffirini said. One of the locations being considered is the grounds of the Karnes County courthouse complex in Karnes City. John Bosch, a retired air monitoring expert with more than 30 years’ experience at the U.S. Environmental Protection Agency, said the new monitor is “a very general thing that’s intended to measure the general exposure of people in the area. “It’s not going to solve any of the … immediate, localized health problems caused by major leaks of toxic gases from emitting sources [in the] petroleum industry,” he said. TCEQ spokesman Terry Clawson said the monitor will take continuous measurements of 46 volatile organic compounds (VOCs). These chemicals are released during all stages of oil and gas operations; some, like benzene, can cause cancer after sustained exposure. The monitor will cost about $12,000 to build and $135,000 per year to operate, Clawson said in an email. Clawson cited a mobile monitoring study by University of Texas at Austin scientist David Sullivan as a factor in the agency’s decision to place the monitor in Karnes County. Sullivan’s study, conducted over 12 days in May and June, was not intended to focus on local air quality within the county. Instead, he collected data on the fringes of the Eagle Ford — an area almost twice as large as Massachusetts — to determine whether oil field emissions were migrating upwind or downwind of the shale play. Long-time TCEQ critic Lon Burnam, a Fort Worth Democrat who is serving out the last few months of his term in the Texas House of Representatives, dismissed the TCEQ’s action as disingenuous. If the agency were serious about tackling oil and gas emissions, Burnam said, it would develop stricter pollution limits and conduct more studies to try to understand the health effects. “This is Texas and the TCEQ — too little, too late,” he said. Local elected officials have also called for improved air monitoring in the Eagle Ford. Karnes County Judge Richard Butler, the county’s top executive, said TCEQ officials told him in March that they were considering installing a monitor in the county because of increased attention on emissions. A few weeks ago, he said, TCEQ confirmed it would do so. “It will either give us reassurance or it will give direction and knowledge that will help us correct any deficiencies,” Butler said. Shelby Dupnik, one of four Karnes County commissioners, said he began to think seriously about the air pollution implications after he saw an online Weather Channel documentary that accompanied the CPI and InsideClimate News investigation. In June, he and Butler approached the TCEQ to further discuss monitoring in the county. They also reached out to Zaffirini. “It was a group effort,” Dupnik said. During his meetings with the TCEQ, Dupnik said, he has emphasized the need to move swiftly and to “get the most accurate data we could find” about how oil and gas activity is impacting the air. 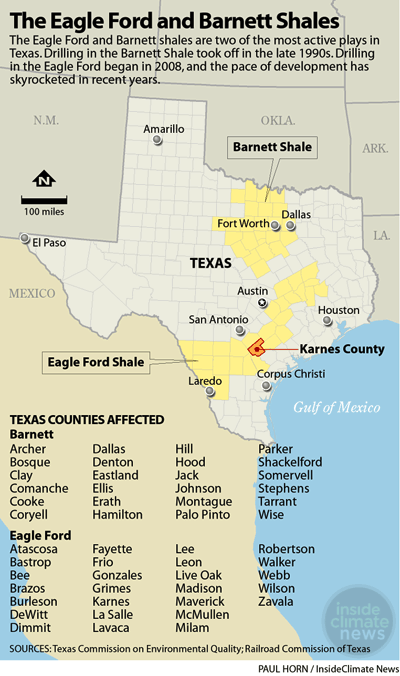 Those impacts could extend far beyond the Eagle Ford. In recent years, rising levels of ozone, a major respiratory hazard, have prompted San Antonio to study the extent to which emissions from the Eagle Ford are contributing to the problem. The city, which is about 50 miles northwest of Karnes City, is now at risk of being declared out of compliance with federal ozone standards.If that happens, the city could be subject to additional air quality regulations. The study by David Sullivan, which helped the TCEQ decide to install the new monitor in Karnes County, found that certain hydrocarbon emissions in many cases were higher downwind — toward San Antonio — than upwind, a finding he described as statistically significant. Some of the hydrocarbons he detected contribute to ozone pollution. Sullivan said the new monitor could help validate ozone studies. As scientists develop computer models to project how the Eagle Ford activity is affecting San Antonio’s air quality, they will be able to check their models against the real-life data, he said. In early September, Judge Nelson Wolff of Bexar County, which includes San Antonio, wrote a letter to TCEQ Chairman Bryan Shaw after reading a series in the San Antonio Express-News in August that detailed air pollution in the Eagle Ford from natural gas flaring. Lynn Buehring, who lives a few miles outside of Karnes City with her husband Shelby, is also cautiously optimistic. At least 50 oil and gas wells and nine processing plants have been built within 2.5 miles of the Buerhings’ single-story ranch house, and they’ve been complaining for years that emissions are making them sick. 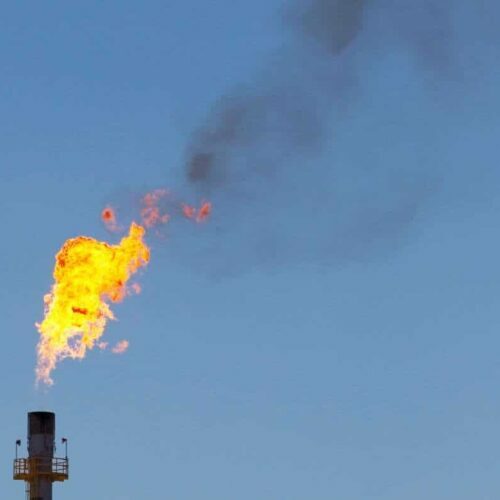 Omar Garcia, president and CEO of the South Texas Energy & Economic Roundtable, an industry group, said in a written statement that the monitor will give the TCEQ a better understanding of the air emissions from all sources. “Industry will continue working with regulators and within their companies to employ programs and equipment to lower, capture and eliminate emissions,” Garcia said. But Schade said the monitor could have an indirect “watchdog effect” on the industry. “Once there’s a monitor in place, people might get a little more careful,” he said, and do more to reduce emissions from their operations. This article is part of an ongoing investigation by the Center for Public Integrity and InsideClimate News into air emissions created during oil and gas production. Lisa Song and David Hasemyer are reporters with InsideClimate News. The Center’s Jim Morris contributed to this report.